Ancient Arts stained glass studio (http://www.ancientartsstainedglass.com) was first contacted by Rita Swartz, Development Director for the Little Sisters of the Poor (http://www.lspsocal.org), in October, 2007. The Sisters were creating a private chapel in their residence and they wanted to explore the possibility of incorporating stained glass windows in the chapel. 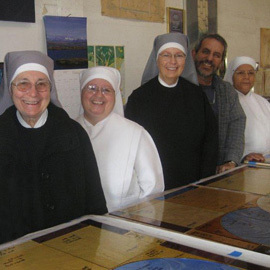 The Sisters operate a large facility for the care of the elderly in San Pedro, California and in other locations in the United States and other countries. They are widely regarded with respect and affection for their life of devoted service and the excellent care that the residents receive. In October of 2009, their founder Jeanne Jugan, was canonized by the Roman Catholic Church. In the summer following our first preliminary meeting, Mother Marguerite, the Mother Superior of the Sisters in San Pedro decided on a concept of a scene taken from a beloved painting: a realistic picture of the founder Jeanne Jugan serving the poor with a rural French landscape. Because of he very detailed nature of this picture, this concept was finally deemed too expensive. Ancient Arts stained glass studio presented some pictures of more simple designs, one of which had been created for another convent and which ultimately proved to be the inspiration for the final design. The Sisters hired an architect to assist with the interior design and the furnishings of the chapel. This architect, Christopher Brown, took the circle elements from Ancient Arts' previous convent windows and suggested a series of similar but interlocking circles. This idea was very pleasing to all parties concerned and eventually was approved by the national and international hierarchy of the Little Sisters of the Poor. The contract was approved in September, 2009. 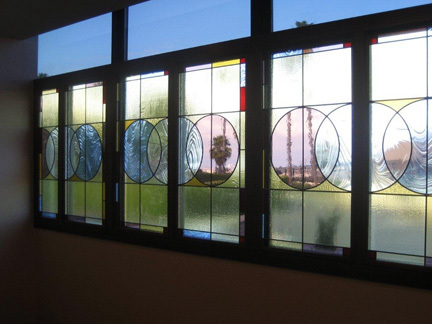 At that time, a woodworking company began work on a beautiful custom made framework for the stained glass windows. 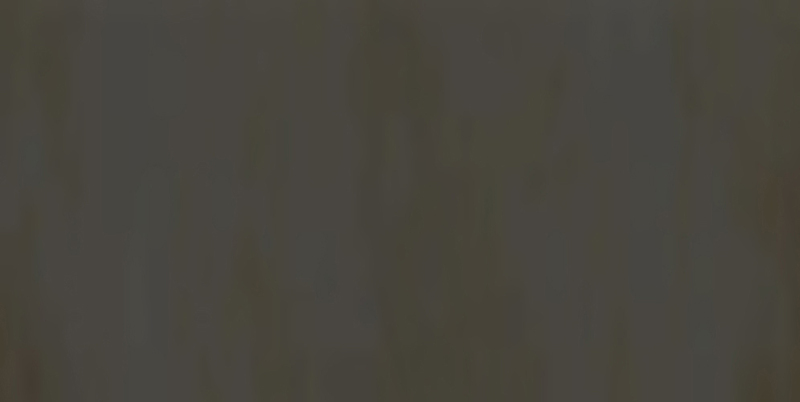 Ancient Arts was able to take measurements in mid-October. After the full scale designs were approved and glass was selected, the Sisters visited Ancient Arts stained glass studio one final time in November, before fabrication with the lead commenced. In the photograph at left, we see the looks of happiness on the faces of the Sisters looking over the stained glass in the workshop. On the day of installation in February, 2010, their joy was even greater. It was an honor for Ancient Arts stained glass to work with these kind and thoughtful women who were so appreciative of our efforts. 15 feet wide and 4 feet high.